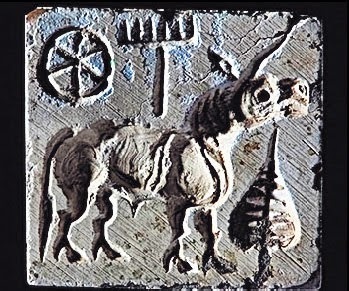 Archaeological Survey of India (ASI) in January 2014 unearthed a Harappan seal from Karanpura in the Hanumangarh district of Rajasthan. “The seal consists of two Harappan characters, with a typical unicorn as the motif and a pipal leaf depicted in front of an animal. There is a knob behind the seal,” says VN Prabhakar, superintending archaeologist, who led the ASI. Maintaining that the discovery ‘confirms’ that the site belongs to the mature Harappan period, the time when the civilization was at its peak (2600 BC to 1900 BC), he said: “A cubicle chert weight was also unearthed in a different house complex. Both the seal and the weight establishes that the people of this area participated in commercial transactions.” Besides artefacts, house complexes built of mud bricks of early Harappan and mature Harappan periods were also unearthed ( News Source: Hindustan Times).